"ANYTHING YOU NEED... WE'VE GOT IT!" As the leading jewelry findings distributor in the U.S., we carry the largest stock of the supplies you need. We can offer huge savings and will try our best to ship same day on most of our items if your order is placed before 2:00 PM Pacific Standard Time. All of our products are scrupulously hand tested and inspected for defects to assure your total satisfaction. Since 1980, Bella Findings House has been supplying jewelers and hobbyists around the world with the largest variety of quality findings, semi-precious and precious beads, pearls, jewelry boxes, displays, tools and supplies. Over the years we have gained experience and expertise that is unparalleled in our field. Our bulk purchasing practices assure that you will receive the absolute lowest price and fastest shipping in the industry. We ship via UPS 5 days per week. 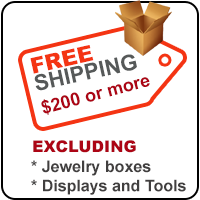 We provide free ground shipping on orders of $200 or more for beads and findings only (Excluding Jewelry boxes displays and tools). Please note that due to the size and weight of the Jewelry boxes, tools and displays shipping costs may be considerably more than the estimated shipping cost shown at the checkout, please contact us for exact shipping costs. bellafindings.com will always contact you if the shipping costs are more than the estimate shown at the checkout page. Shipping outside the USA will be done through the United States Postal Service and will cost about $36.00 for a small box. On some rare occasions we have to change prices that occur due to computer errors. We will contact you with the correct price before the items are shipped out. We apologize for any inconvenience this may cause you. We offer returns with a full refund on all returned merchandise except for special orders, beads, pearls, chains, Swarovski crystals, wire and merchandise that we suspect has been used or altered in some way. Items must be returned within 15 days from the date of their receipt. We recommend insuring all returned packages, as we do not accept the responsibility for any lost or damaged merchandise. Simply call 213-489-4252 and request a Return Authorization Number. Please include a copy of your receipt in the returned package.